The military has been an honorable institution in which to serve for thousands of years in many countries all around the globe. Here in America, it has been no different. The military has been an honorable institution in which to serve for thousands of years in many countries all around the globe. Here in America, it has been no different. Serving in the United States Armed Forces, regardless of the branch, has brought distinction to many men and women since our country's founding. Many service men and women are awarded medals, badges and other commendations for duties performed in exceptional ways. These awards and recognitions are never taken lightly, they are never given without good reason and they should never be stored without having them displayed with the honor they deserve. 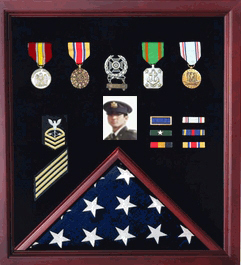 If you or a loved one has been recognized by the military with badges, medals or an American flag, what you need in order to display them properly and with honor is the Flag Photo and Badge Display Case. This case is made with real wood and the finest display glass. The case holds a 3 x 5 flag in a triangular display section designed for the flag alone. Any badges, medals or certificates that that have also been awarded can be arranged beautifully alongside this prominently displayed flag.